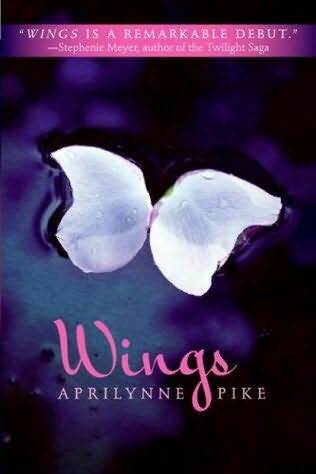 Synopsis, taken from Aprilynne's website: Laurel discovers she is a faerie, sent among humans to protect the gateway to Avalon. Thrust into the midst of a centuries-old battle between faeries and trolls, she's torn between a human and a faerie love, as well as her loyalties to each world. In this extraordinary tale of magic and intrigue, romance and danger, everything you thought you knew about faeries will be changed forever. I really enjoyed this book. It was a quick, easy read (which is saying a lot coming from me, because I'm the slowest reader ever and I managed to read this in 24 hours). The characters are likable and believable, and so is the storyline, even with the fantasy elements. Ms Pike describes things in such a way that even though things like faeries aren't supposed to be real, it seems almost natural, and you begin to believe it. I liked the premise of the book - I expected it to have a lot more to do with faeries, but it was basically a regular young adult fiction with fantasy elements woven in, and it's different from all the other books about faeries I've read. Ms Pike puts a whole new spin on faeries. Laurel's transformation and then discovery that she's a faerie, finding out where she came from and why she's living with humans, then meeting other faeries, it's all really interesting, and as I said before, almost natural and not your typical out-there fantasy. Laurel learns a lot about herself and goes through many changes in a short time frame and she handles it all really well - no whining or self-pity like some other characters I've read in recent books. It's always refreshing to read a young adult novel where the female lead is strong and independent, and doesn't fall in love the second she sees the male lead. Don't get me wrong, I love those types of books too - in fact, in the novel I'm writing, my main character meets the romantic lead a couple of chapters in and is almost instantly infatuated - but it's nice that not all books are like that, because at one time, it seemed like they were. David, Laurel's best friend/love interest is a sweetheart, the boy-next-door type, the guy most girls would want as her best friend and/or boyfriend. He's steady, easy-going, caring and thoughtful, and when Laurel confides in him, he believes her without question. He would do anything for her, including wait while she sorts out her feelings for him and tries to separate them from her feelings of needing him to get through. I'm curious to learn more about Tamani, the faerie that Laurel meets and learns she has a past with, and see how this particular love triangle will turn out - whether Laurel will choose David or Tamani, stay in the human world or return to Avalon to live with her original family, the faeries. Wings gets really interesting about half to three-quarters of the way through when there's more action and suspense. The ending had me wanting to read the next book, Spells, right away.